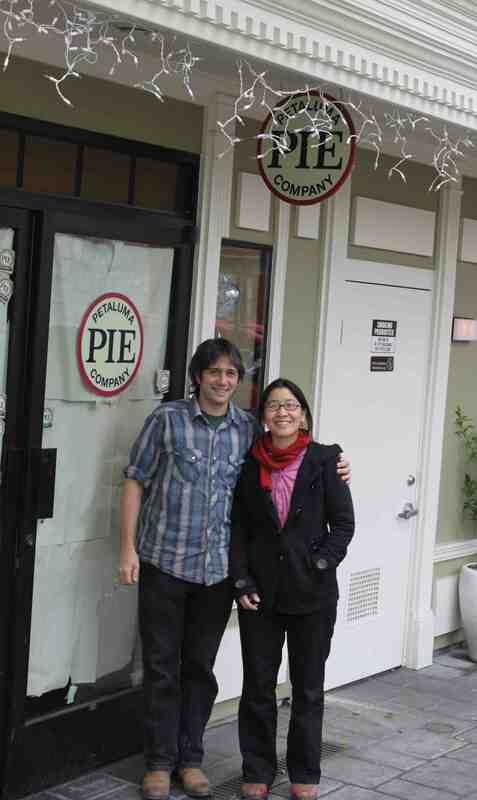 Turns out that opening a pie shop is not as “easy as pie” but for filmmakers and bakers Angelo Sacerdote and Lina Hoshino, it is a step towards realizing their dream of having a business that expresses their values about food and community. The Petaluma couple’s Petaluma Pie Company has its grand opening tomorrow from 1 to 4 p.m. in the space formerly occupied by Bella Luma Caffe in Helen Putnam Plaza. Petaluma Pie Company will specialize in serving sweet and savory pies, along with soup, salad, coffee, tea, beer and other beverages. You may have already tried a slice during the past two weeks–the company’s “pie-let” period—when they were experimenting with pies and eliciting feedback. The timing for Petaluma Pie is perfect. Christmas is just around the corner; Petaluma has become a foodie destination; and pie, which has been around forever, has been acknowledged in foodie circles as “the new cupcake.” In the past couple of months alone, there have been articles in the New York Times, Wall Street Journal, and San Francisco Chronicle journaling pie’s ascension to the top of the dessert summit. There are pie centric shops opening up all over the country and Sacerdote and Hoshino seem to have nailed it with their diverse menu that updates old favorites and includes new interpretations. Saturday’s menu will feature about 6 pies—available for purchase as 9 inch pies or by the slice: walnut pie, Shaker meyer lemon pie, banana cream pie, Fuji apple pie, chestnut pumpkin pie. 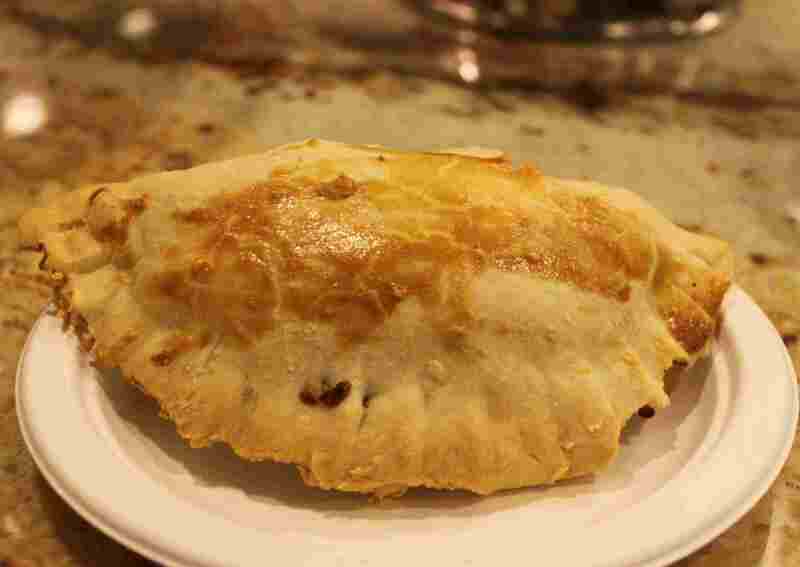 Savory pies (turnovers) will include: cheese and onion pie, mixed mushroom pie. Savory pot pies will include: seitan mushroom pot pie (vegetarian) and smoked salmon pot pie. Sacerdote did not go to culinary school but his hands-on experience started very early. “I did a long stint with Julia Child. I’d watch her on TV, cook, and just experiment. I’m trying new ideas out all the time.” Hoshino loves to experiment too and is working hard to perfect a green tea cheesecake. Gluten free in the Pipeline: There have already been requests for vegan, no sugar, and gluten free pies. Sacerdote has perfected a gluten free crust using sorghum and rice flour that tastes fantastic and has an excellent texture and will be offering gluten free pies shortly. The company is currently offering a vegetarian seitan (wheat gluten) mushroom pot pie which is a delicious alternative to the traditional and somewhat tired soybean-based meat alternatives . “We have a huge garden for a small property and we’re experimenting.” said Hoshino. “We’re going to be using a lot of seasonal things so the menu will be changing constantly.” So far, the couple grows heirloom squashes, pumpkins, kale, green onions, garlic, rhubarbs and berries– loganberries, raspberries, blackberries. They have planted fig, pomegranate, persimmon, apple, pear, and walnut trees. They plan to augment what they don’t produce with local suppliers–Petaluma Bounty, local farmers and suppliers like Gourmet Mushrooms, Inc. in Sebastopol for organic exotic mushrooms. exceptional for baking applications. It’s high in the antioxidant beta carotene and low in calories. 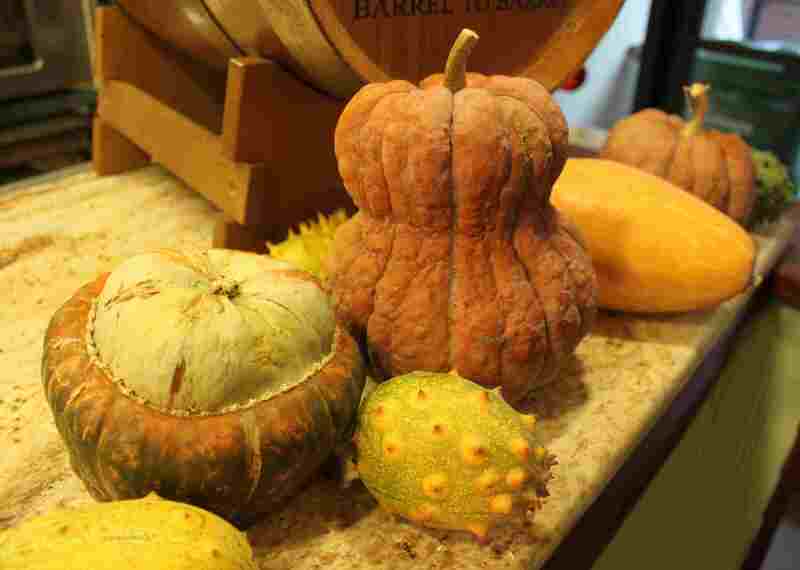 In Japan, the squash is often referred to as a Japanese pumpkin. 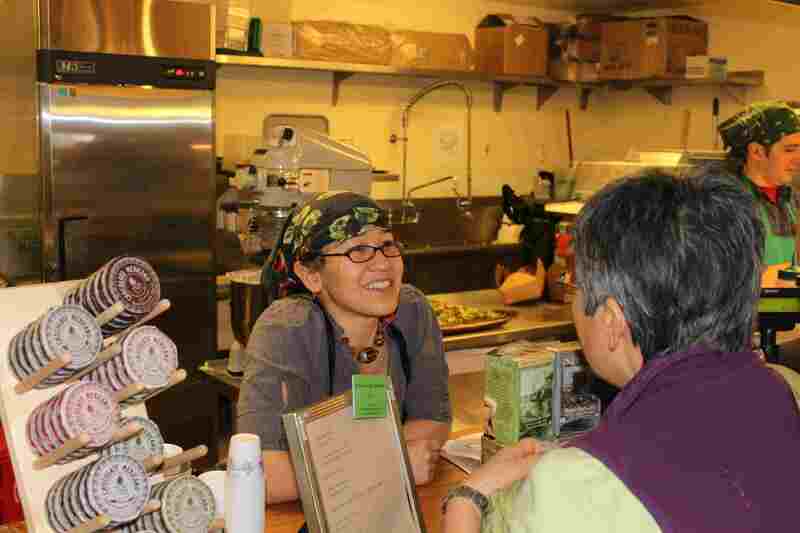 Hoshino uses the shishi gatani is the Japanese curry pie along with apples and vegetables. Japanese curry is sweeter than most Indian curries and in Japan it is a comfort food which is popular but rarely made from scratch. When you visit PPC, don’t get so carried away by the awesome pie aromas that you forget to look around. Check out the cool “pie mirrors” on the walls made from pie pans lined with mirrors and the light shades made out of inverted mason jars. Santa delivers a new sign: In November, the Petaluma Pie Company first made the local news when its custom-designed 3-D hanging sign was stolen, presumably as a Halloween prank. The sign never turned up and the couple could not afford to replace it. Earlier this week, the sign makers, Carleen Weirauch and Robert Moeller with Duncan Design Inc. in Santa Rosa, generously gifted them with a fabulous new 3-D sign to replace the missing one. ARThound says “BAKE! BAKE! 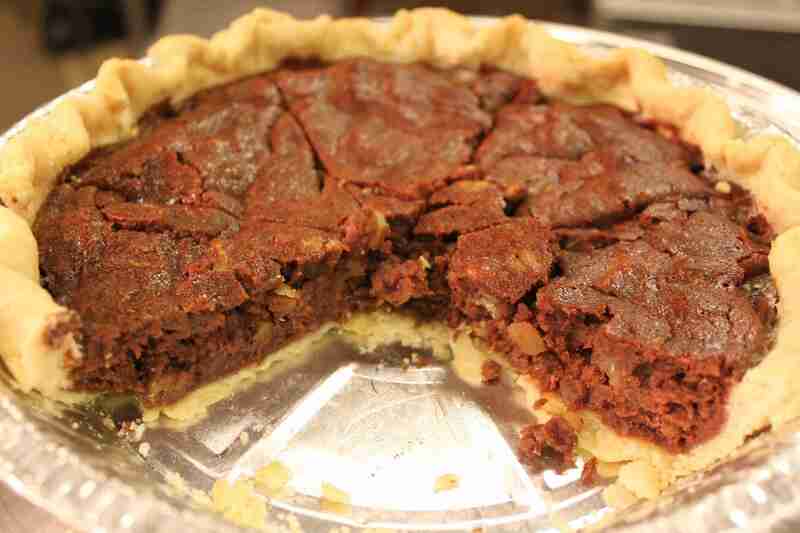 BAKE!”…it will probably be raining on Saturday and nothing beats a slice of warm hearty pie on a cold wet day. Details: Follow your nose! The Petaluma Pie Company, 125 Petaluma Blvd. North, Suite D, (formerly occupied by Bella Luma Caffe) in Helen Putnam Plaza, on Petaluma Blvd. North, has its grand opening this Saturday, December 18, 2010, from 1 to 4 pm. Live music from Sweet Penny Royals, free pie samples, mulled wine and ciders. Phone: (707) 347-9743. www.petalumapie.com.